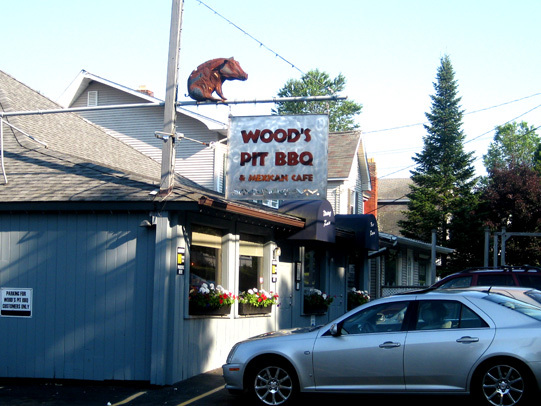 Wood’s Pit BBQ in Bantam, Connecticut is an unassuming, family-friendly restaurant on picturesque Bantam Lake. Don’t let that fool you. The food here is some of the most authentic southern barbecue and Mexican food you’ll find in New England. Wood’s was the first Mexican restaurant in Litchfield County, Connecticut, having opened in the early 80’s. A decade later, they became the county’s first authentic barbecue restaurant. The feeling inside Wood’s is local and friendly, with checkered tablecloths, homey décor, and plastic bottles of barbecue sauce on each table. A bowl of smoky salsa and corn tortilla chips appear almost immediately. The salsa has just enough of a kick to make the frosty margaritas and strawberry daiquiris welcome when they arrive from the full bar just next to the dining room. The menu is vast and decisions can be hard, the toughest question being: barbecue or Mexican? Like many other customers, we decided on both. In addition to favorites like wings, nachos and crab cakes, Wood’s offers daily specials. 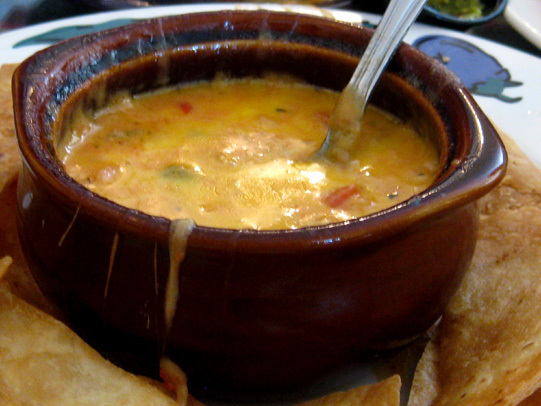 We opt for one of these: Chili con Queso, a crock of bubbly, cheesy fondue with tomatoes and mild green chili and a side of warm, fried flour tortillas. 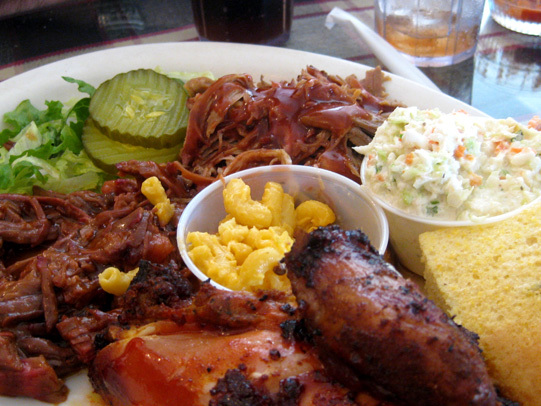 Barbecue combo platters offer a choice of pulled pork, beef and pork ribs, sliced or chopped brisket, and chicken (white or dark meat), with cornbread and your choice of two sides. The shredded brisket arrives bathed in the tangy sauce Wood’s has become famous for and is fork-tender. Pulled pork is smoky - flavored from the green hickory in the pit - and juicy, though un-sauced upon arrival (that’s what your plastic bottle of barbecue sauce is for), and the ¼ chicken is slightly charred on the outside and incredibly moist inside. The cornbread is warm and crumbly, the best I’ve had since the last time I ate my Texas-born grandmother’s. As for the sides, the choices are almost intimidating: baked beans, French fries, sweet potato fries, baked potato, baked sweet potato, coleslaw, macaroni and cheese, collard greens; believe it or not, the list goes on. We thought the coleslaw and sweet potato fries were the highlights. Sandwich baskets are also available featuring barbecued pork, beef or chicken with fries and coleslaw, all for under $10. The Mexican side of the menu features tacos, enchiladas, burritos, chimichangas and quesadillas, each customizable with your choice of Wood’s smoked meats. Surprisingly, vegetarian options abound: spinach, garlic, onions, and cheese are all options. 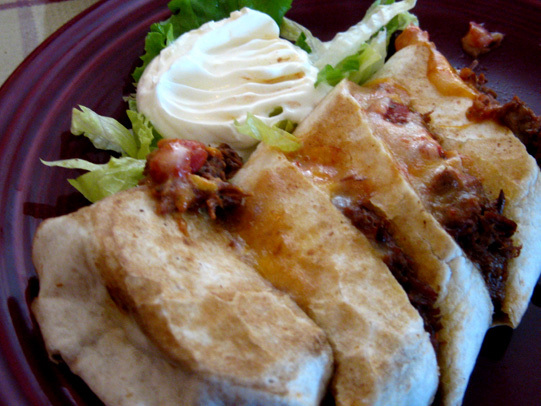 The quesadilla with shredded beef was unadorned perfection; mouthwatering meat, gooey cheese and cool sour cream on the side. Individual Mexican items can be ordered as a side, and are priced between $6 and $10 - a great way to sample both “sides” of the menu. The vast menu also includes salads (the taco salad, to my companion’s surprise, was predominantly lettuce and topped with shredded beef instead of ground, taco-style beef, but tasty nonetheless), pizzas (the white shrimp pie being the most popular), and seafood (we wish we’d had room to try the Cajun blackened catfish). As for dessert, the options are basic (a brownie sundae) and mostly homemade (apple pie, peach cobbler). The cobbler was warm and comforting, a perfect ending to our meal. Wood’s is a casual, laid-back spot for a family lunch or dinner (they offer a kid’s menu for $7.95), but the food elevates the restaurant from local hangout to regional destination. The menu asks the customer to be patient, as authentic smoked barbecue takes time (“low and slow”), so kick back and enjoy the homey atmosphere and local conversation; the food is well-worth a few extra minutes. Their complete menu is also available for take-out.